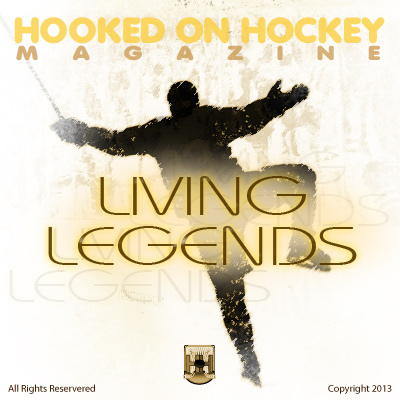 Today we’re going to take a look at the only goaltender on our list of current Living Legends. He’s right up there with the greatest goaltenders of all time and he owns a majority of the goaltending records. Even at the age of 40 he’s still at the top of his game. Let’s take a look at the skills of New Jersey Devils‘ goaltender, Martin Brodeur. On Thursday, March 22nd, I took a trip out to PNC Arena in Raleigh, North Carolina to watch Brodeur make his first start since a pinched nerve held him out of the lineup for a month. Boy did I get a treat. Not only was Brodeur spectacular in making 17 saves in a 4-1 victory, he also scored a goal, the 3rd of his career. The saves were few and far between, but some of them were absolutely spectacular. Brodeur showcased all of the different things that make him so special over the course of that 60 minute game. I’m going to try and put those things into words for you in the following paragraphs. Let’s get started. One of my buddies, a relatively new fan of hockey, was at the game with me and he was pointing out how Carolina Hurricanes‘ netminder Dan Ellis was struggling with his puckhandling but Brodeur was having far more success. That led me to pay even closer attention to Brodeur’s “playmaking”. Sure, I had heard stories of his abilities and I had heard how he was probably the best puckhandling goalie in the history of the game. I mean just this past postseason, Brodeur set the NHL record for most assists by a goaltender in a single postseason with 4 assists. But when you see his “playmaking” live, boy is it something. Most goaltenders will come out of the net without a particular play in mind. They will wait for the incoming forechecker to press them one way or another and then they will make a play in the opposite direction. Not Brodeur. Brodeur was coming out of his net, meeting the puck before the goal line and was making one touch passes to his defensemen. Instead of stopping the puck and assessing the play, Brodeur was reading the play on the fly and making quick and accurate breakout passes. He was catching the Hurricanes in the middle of line changes with his accurate passes up to center ice. This is such a useful skill for a team because it’s almost as if you have a 3rd defenseman. I’ll try and showcase a few of his better puckhandling videos. Take a look at this video here. 99% of the goaltenders will freeze the puck in this situation and just take the faceoff. That’s exactly what every Boston Bruins player thinks is going to happen. Instead, Brodeur gloves it, and in one motion drops it to his stick and fires a laser pass out to center ice to spring his teammate for a breakaway. Are you kidding me? There are only a handful of defensemen that could make that pass, let alone a goaltender making it. You can see at the 7 second mark that’s he’s caught every single Boston player out of position because they thought he was going to take the faceoff. Having a goaltender that can do this is simply unbelievable. Check out this one. This is another play when most goaltenders are just going to freeze the puck and take the faceoff. Just like the Bruins in the previous video, the Philadelphia Flyers think the same thing is going to happen. If you freeze the video at the 0:02 second mark, you can see that Brodeur catches all three forwards and one defenseman on the wrong side of center ice. This sets up a great scoring chance that is finished off by Alexei Ponikarovsky. The thing that makes these passes so special is that Brodeur can quickly change the flow of a play before the defense can recover. Like I said earlier, this skill is unbelievable to have in a goaltender. Probably the most impressive thing about this goal is that the puck does not touch the ice until it is on the other side of center ice. A lot of goalies get their attempts snuffed out because they don’t have the wrist strength to get the puck elevated and keep it elevated. Brodeur now has 3 goals to his name, and is the only goaltender to ever score a game-winning goal. We’ve all seen them. We’ve all seen the goalies perform grand larceny on unfortunate shooters. These desperation saves are often predicated on a significant amount of luck as the goalie makes an all-out, last-ditch effort in the direction of the oncoming shot. However, I don’t know of a goaltender that’s made more miraculous saves than Brodeur. That made me think…has Marty got this down to a science? After reviewing the tape, I think Brodeur has figured out several key elements to making a desperation save and has combined them to become a human highlight reel. Watch the video below and I’ll try and explain how these saves are more than just luck. Wow, what a save. Is this save luck or is there a little bit of intelligence behind Brodeur’s movement? I’m going to break this save down for you frame-by-frame. Notice how Brodeur’s right skate is hugging the right post and he’s standing straight up with his knees slightly bent. At this point, Brodeur is anticipating the pass across and he’s bracing his skate against the post in order to give himself a big push across the crease. At this point, Brodeur has dropped down to his right knee and has pushed across to square himself up to Sabres’ forward Jason Pominville. This is where Brodeur vastly differs from your average goaltender. Most goaltenders will push straight across the crease. If you do that, you allow an extra 3-4 feet of space to the shooter, space enough for the shooter to elevate the puck. 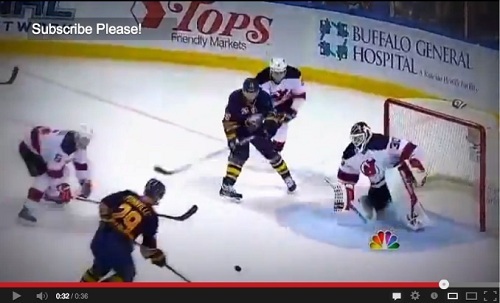 Brodeur instead pushes straight out towards Pominville, taking away time and space from him. Here we see Brodeur dropping into his trademark two-pad stack to make the save. This is what separates Brodeur from all the other goaltenders. Most goaltenders will push out at Pominville in the buttefly position, which involves the goaltender being on their knees with their elbows tucked in and their shoulders straight up. However, that butterfly position leaves a lot of room available to the shooter on both the glove and blocker side. Brodeur instead drops to his side, taking away the entire bottom of the net, and by pushing out directly at the shooter, makes it nearly impossible for the shooter to get the necessary elevation to get it up and over him. That’s why the two-pad stack has been so successful over the years. I’ll throw in a little bit of math for you. Each goalie pad is 11 inches wide. Stack two on top of each other in a two-pad stack and you have about 2 feet of coverage. A hockey net is only 4 feet (48 inches) tall. With his two pad stack, Brodeur can take away half of the net. Then, Brodeur places his glove which is 18 inches wide, on top of the pads, giving the shooter about 8 inches at the top of the net to shoot at. That’s a pretty tough target to hit without having time to line it up. Brodeur has calculated this maneuver and has figured out that by taking away the easiest shot (the bottom of the net) and making it difficult for a shooter to elevate the puck (by pushing towards the player, taking away time and space), he can make most of these desperation saves. It also helps that he has an uncanny ability to track the puck and is one of the quickest goaltenders I’ve ever seen in recovering his position. Watch some of his other remarkable saves in the clip below. This is such a crucial advantage for a goaltender to have. You often hear that a goaltender should wait for a shooter to make the first move and then they can react accordingly. However, most goaltenders have tells and already have a move in mind. The shooter can anticipate that move and then make the necessary move. It’s basically a mental chess match that often results with the goalie being at a major disadvantage. Not the case with Brodeur. Brodeur has all the tricks, all the saves, all the maneuvers, and most importantly, has the patience to out-wait the shooter. The shooter is forced to make a move and Brodeur can then do any one of his moves to make the save. That’s why he has always been one of the toughest goalies to score on. New Jersey Devils goaltender, Martin Brodeur, showcasing his phenomenal puck-handling skills. Seriously? Who thinks of making a “scorpion” save? I can see why shooters have no idea what Brodeur is going to do. I can’t even imagine having the flexibility to make that kind of save, let alone actually doing it. Simply remarkable. I’ll break this save down for you as well. Watch how Marty squares up to Washington Capitals’ forward Alexander Ovechkin on this penalty shot. This is textbook preparation as Brodeur’s glove is high, and he is backing in as Ovechkin approaches him. In this frame you can see Ovechkin bearing down on his stick as he is preparing to shoot. 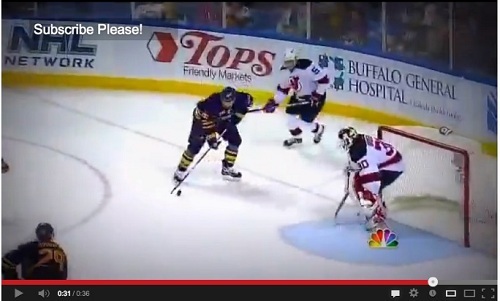 To the naked eye this may not look like much, but what I want you to take note of is Brodeur’s glove position. 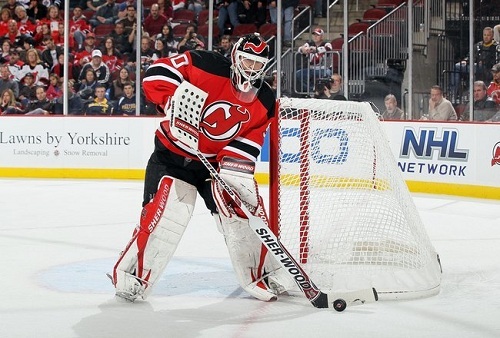 Notice how Brodeur’s glove is no longer high, but is actually now very low, resting on his pad. Having your glove resting on your pad is a cardinal sin for a goaltender as that leaves you very vulnerable to getting beat high glove-side. However, Marty is doing this intentionally, trying to bait Ovechkin into shooting the puck there. Marty wins. Ovechkin takes the bait and fires it high glove. See how quickly Marty gets his glove back up to rob Ovechkin. He simply outsmarted one of the best goal scorers of this generation. These are just a few of Brodeur’s skills. I could probably write an entire book discussing his workout regimen, agility training, flexibility training, intelligence, etc. etc. The three skills/qualities I pointed out for you to see here are things that I believe truly separate Brodeur from all other goaltenders. This is only a small sample of all the skills he possesses, skills he has used to become the NHL’s all-time leader in regular season games played, wins (career and single season), saves, regular season shutouts, and playoff shutouts (career and single season). He is an absolutely remarkable goaltender and I for one will be sad to see him hang up his skates in the next couple of years.